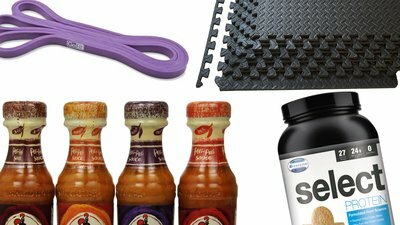 From hot sauces to super bands and floor pads, we've got everything you need to make your next workout super spicy! Whether you're eating clean or just eating leftovers, a little extra spice can mean the difference between "Hooray for lunchtime" and "Why, god? WHY?" Serious fit folk tend to be incredibly brand-loyal to their favorite hot sauces, but if you're looking for a new contender, seriously consider Nando's Peri-Peri Sauce. This South African import is hot enough to get your attention—and make my bald head glisten—but not so hot that you can't pour it on, rather than just add a few squirts. It's a bit creamy, surprisingly complex, and damn delicious on just about everything. I use these bands all the time with clients. The heavy-duty ones are great for lightly assisting with pull-ups, and the lighter bands can add dynamic tension to a variety of movements. I also use these bands to help clients stretch their hamstrings and shoulders. I prefer them to open bands with handles because they are much easier to work with—plus you're not limited to tying knots if want to loop them around an anchor point. I also trust them not to break like the handle bands tend to do. These bands are light enough to take anywhere yet adaptable to every workout style, from rehabilitative corrective exercise to high-intensity interval training. I do a lot of bodyweight exercises and yoga at home using a yoga mat I got at a sporting goods store. It covers about 14 square feet. It's nice because you can roll it up, but I never do—I just leave it in the same place on the floor. So, I'm switching out that setup for two packages of ProSource Puzzle Exercise Mats. For under $50, I can get 48 square feet of non-toxic, waterproof, impact-absorbent, half-inch-thick EVA foam. The mats snap together quickly and don't come apart while you work out. They come in three colors. Plus, it'll make your space look and feel more like a real gym. Priceless! We try a lot of protein powders here at Bodybuilding.com, but this is hands-down my favorite flavor. The blend of cinnamon and vanilla is amazing when added to milk; it's like drinking a cookie. I also add a scoop to my pancake batter to make them taste like pumpkin pie spice flapjacks. If Snickerdoodle's not your thing, PEScience's Peanut Butter Cookie is off-the-charts tasty as well!